The fee is $45 for the three classes or $20.00 for one. Every recipe will Vegan, made with plant-based foods – NO MEAT, DAIRY, or EGGS! These classes are not intended to change your eating habits to become vegan, but to broaden your understanding of veganism and to show that there is so much more than steamed veggies and salad as options. They are intended to demonstrate that these meals can be prepared cheaper, can be purchased from locally grown substances (mostly), reduce our carbon footprint, costs, calories and cholesterol! Additionally, these meals can be prepared quickly and easily! 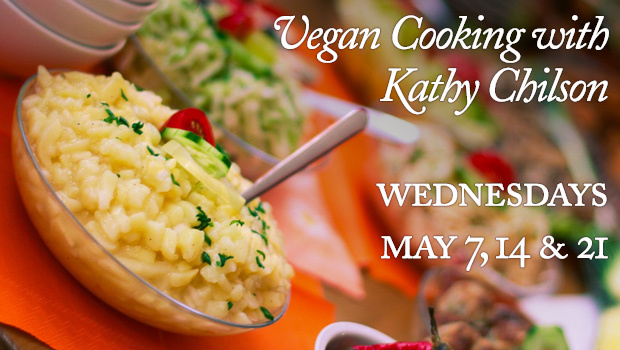 Kathy is an incredible cook with a huge variety of ideas to make your meals absolutely delicious without sacrificing anything. You won’t want to miss this whether you’re looking to add more plant-based foods to your regular diet, or considering making the leap! We hope to see you!